Announce your wedding day with style! 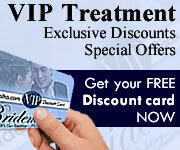 10% Discount for the bride & groom when showing the BrideMalta VIP card. Individually made and personalized especially for each couple, our modern custom made stationery will set the theme for your day right through to the very last thank you note. Addicted as we are to top quality and original design, we also offer sensible prices. And we don't have minimum order requirements or hidden charges, so order as few or as many as you like. We can go from elegant classic to something outrageous, or even just good old-fashioned invitation. Mornings & Saturdays by appointment. This page has been visited 24246 times.